Everything about energy drinks, natural energy drink, red bull, soft drinks, 180 energy drink. Energy drinks are non-alcoholic, often lightly carbonated beverages that are designed to give the consumer a burst of energy by the addition of a number of energy enhancing ingredients, most notably caffeine. They are commonly available in grocery stores, corner stores and gas stations, usually displayed alongside soft drinks, juices and sports drinks. Chances are, you have already spotted some small, bullet-shaped cans in the fridge at your local convenience store, come across a dedicated Red Bull display at a big box retailer, or have been handed a free promotional can of one energy drink or another at a sporting event. Despite warnings that energy drinks should not be mixed with alcohol, they have nevertheless become quite popular at bars and clubs, and some brands even include recipes for alcoholic mixers made with their energy drinks on their websites. Energy drinks are currently enjoying a growth in popularity and marketing presence, and newcomers to the scene seem to be popping up constantly. 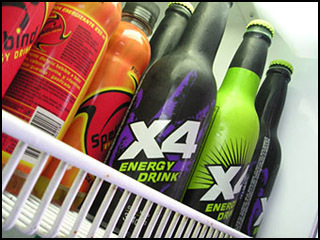 Over 200 new energy drinks hit store shelves in 2006, according to the market research firm ACNielsen. Led by such brands as Red Bull, Rockstar and Monster, energy drinks are a $3.7 billion industry whose revenues have increased by 51 percent in the past year alone. Many energy drinks have names that convey strength, power, speed, and sexuality (such as "Full Throttle", "Impulse", and "Pimp Juice"), and many seem to be marketed primarily to a male, 18-30 crowd. Most brands have their own websites that reflect the image emphasis of the brand (heavy rocker, BMX grunge, slick hip hop, etc. ), and often include appropriate background music, sports and celebrity photos from promotional/sponsored events, "energy drink babes", and downloadable wallpapers. Generally speaking, energy drinks are marketed towards young people, such as students pulling all-nighters, movers and shakers "on the go" and those who play sports. At the same time, energy drinks made from fruit juices, teas and dietary supplements like ginseng and glucosamine also appeal to older, health-minded consumers. So What's in Them, Anyways? Energy drinks are usually formulated to give the consumer an energy jolt by using a combination of methylxanthines, B vitamins, and exotic herbal ingredients. Energy drinks commonly include caffeine, guarana (extracts from the guarana plant), taurine, various forms of ginseng, maltodextrin, inositol, carnitine, creatine, glucuronolactone and ginkgo biloba. Some contain high levels of sugar, while most brands also offer an artificially sweetened version. 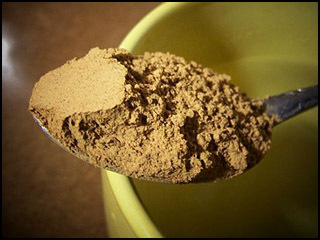 Often manufacturers add a very small dose of a powerful stimulant such as carnitine, but the doses of these add-ins are usually so small that any added "boost" is purely psychological. Despite exotic formulations, generally the energy boost in these drinks is delivered via the whopping dose of common caffeine. Energy drinks should not be confused with sports drinks such as Gatorade or Powerade, which are intended to replenish electrolytes, sugars, water and other nutrients and are usually isotonic (containing the same proportions as found in the human body). However, some products (such as Reload) are now available as hybrids between energy drinks and sport drinks, with both electrolytes and herbal extracts.